I have been seeing Alton Brown’s edamame dip popping up around the food blogging sphere and it always looks good. The recipe looks like an Asian take on a hummus or a bean dip only it uses edamame beans. One of the first things that I noticed about this recipe was the inclusion of the miso paste. Miso is a salty Japanese fermented bean paste that I have come to really enjoy over the last few years and I am always looking for new ways to use it. The edamame dip was super easy to make; you just quickly cook the edamame and then puree everything if a food processor. I did make one slight change to the recipe in that I used some of the water that was used to cook the edamame instead of the oil that the original recipe called for. The edamame beans made for a really nice dip! I liked the way that miso worked in the dip adding a nice salty element and the cilantro added a nice freshness and brightness to the dip. One element that stood out in the dip was the nice touch of heat added by the chili sauce. 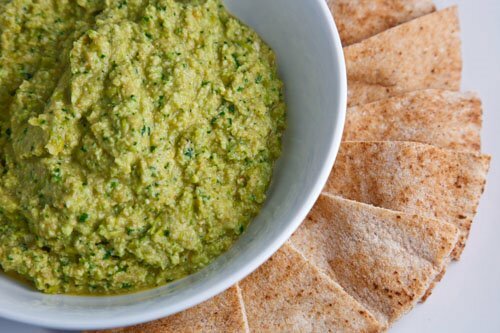 I enjoyed eating this vibrantly green dip with some whole wheat pitas. You could also use this ‘dip’ and a condiment in a sandwich and it would also probably work well as a pesto on pasta. Cover the edamame in water and bring to a boil for 5 minutes. Drain the edamame reserving the water. Mix everything in a food processor adding some of the reserved water to thin the dip to the desired consistency. Found your blog the other day. Love it!! Sent it to all of my friends and family. Kevin, I'm passing on the Kreativ Blogger award to you. Come to my blog and check it out, and thank you for your wonderful blog. I've never eaten edamame except as the plain beans. This looks intriguing. Ooooooo…yes. I'm definitely bookmarking this!!! Fantastic dip! I like that you substituted some of the edamame cooking water for the oil. Another great recipe! A wonderful dip! So flavorful and tempting! I love how healthy this is! I will definitely make this for my boys – even healthier than hummus, which they love. I so love this, Kevin! What a beautiful presentation too! I'd never tried edamame until I went to Japan a few months ago, now I love them. I'd never seen this dip before, thanks for the recipe! This is one fantastic tasty looking dip Kevin! I bet this would taste great with gyoza as well! When I first saw this I thought "edamame pesto!" and then I actually read your entry and realized we seem to be on the same page. That is an interesting blend of flavors… I need to try it. mm yum, I would schmear this on a sandwich as well! Kevin, I just passed on the Kreativ Blogger award to you and your very creative blog. Please check out my site for details on the award. I love this! Edamame is one of my favorites! The addition of miso to this dip sounds delicious! What a great blog! I can't wait to try your recipes. I just made a roasted red pepper hummus. This green edamame version would be the perfect colour compliment. I would like to pass you the 'Kreativ Award'. Do check my blog to see what it's all about. Thanks for the great recipes you've shared. I didn't know this dip used miso as a flavouring! Great idea!! I love miso and, I guess, it's just different versions of the same things, right? soya bean in many forms! We don't get edamame beans but the dip sounds so flavourful and I love cilantro. I've not tried edamame beans, though this recipe certainly sounds tempting. I must seek them out. Alright, I have edamame in the freezer and miso paste in the fridge – I am so making this soon! I would love this Kevin I love the green colour and I love every single ingredient on the list – totally gorgeous! A great recipe that looks good and healthy. I like the color of it. Mmmm! Sounds good – will definitely try. I love edamame and make a cilantro edamame pesto that is similar to this and delicious on salmon burgers. This looks great. I had something like this at a local restaurant and have been wanting to try to replicate it. They served it with some tiny pieces of chopped cucumber and cilantro on top. I absolutely loved edamae so this looks great – one problem – I live in Bowmanville and can't seem to find miso anywhere. Where do you buy yours? Does it come in a tube or container? I love edamame and have seen this dip/hummus popping up all over. Yours sounds awesome and looks so bright and fresh. Nice job. Kim: I tend to get my miso at a local Japanese import store where they have a variety of brands. I have also seen it in other local Asian grocery stores (Chinese and Korean). Some of the larger main stream grocery stores are also starting to carry it in my area. You might also find it at a health food store. I love Alton Brown, and have been wanting to try this for a while now. Happy to hear it's a successful one! And such a gorgeous colour too! Nice one Kevin. I love edamame but never would've thought of using them in this way. I have an edamame dip that I make, but this one sounds even better! I bet this would be so good with sesame oil!